The recent opening of the new National Squash Centre in Australia marks a historic first in the relocation of an entire facility, made possible by the world’s leading court manufacturer ASB, which is based in Germany and Czech Republic. Originally constructed in the Oxenford Film Studios in Gold Coast for the 2018 Commonwealth Games in April, the six glass-backed courts, together with the state-of-the-art all-glass showcourt, have now become the ultimate legacy for Squash Australia in nearby Carrara, Queensland. Delivered to Gold Coast in seven 40-foot containers, the three EventGameCourts (each unit providing three singles courts, convertible to two doubles courts within minutes) and ShowGlassCourt, with moveable side walls, were erected for Gold Coast 2018 by a crack 12-man ASB team in 43 working days. Following the completion of the Games, it then took a further 14 working days for a 12-man team to dismantle and prepare the facility for transfer to Carrara – returning the Oxenford Studios to use for filming. Over a further 30 working days, a six-man ASB team reconstructed two EventGameCourts (leaving the third one in storage for use later in a further legacy facility) – seen below during mid-construction and then in action during the Q Open- plus the ShowGlassCourt at the Carrara Sports Complex to become the heart of Australia’s first national centre. “We have provided the courts for each Commonwealth Games since 1998, all of which have provided long-term legacies for the hosts – such as the all the courts (including the all-glass court) for the 2002 Commonwealth Games in Manchester, which is still in use, and the courts at 2014 Commonwealth Games and the 2015 Pan American Games in Toronto,” said Adam Ondrasik, production manager of ASB Squash. At the opening of the country’s new National Squash Centre – which hosted its first PSA World Tour event, the Q Open, for men and women – Squash Australia Chief Executive Richard Vaughan said: “The National Squash Centre at Carrara is an amazing legacy outcome for the Gold Coast and Queensland. 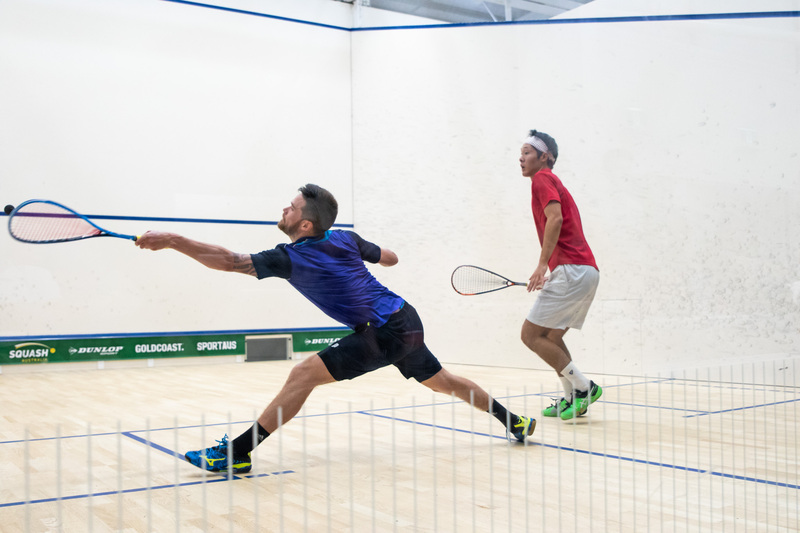 World Squash Federation CEO Andrew Shelley added: “The Commonwealth Games this year is another great example of why squash is such a good fit for all major events, not least the Olympic Games if we are successful in securing a place. “Courts can be built in days, and in the case of a showcourt, taken down in less than 24 hours, returning the facility to normal use. Then the legacy options, as have already been seen around the world, can kick in to support development. A classic win-win! About ASB: ASB SquashCourts have supplied more than 7,000 squash courts to satisfied customers in 70 countries all over the world. ASB SquashCourts have also worked very closely with the World Squash Federation (WSF) and the Professional Squash Association (PSA) to deliver show glass courts for the most prestigious events all over the world. Q Open 2018, Carrara Squash Centre, Carrara, Queensland, Australia.